18" x 20", 500hp at 130rpm engine, Sheriff's Manufacturing Co., Milwaukee, WI. 6' 1" x 12', 140 pounds steam firebox boiler, Manitowoc Boiler Works. Abandoned due to age & condition. 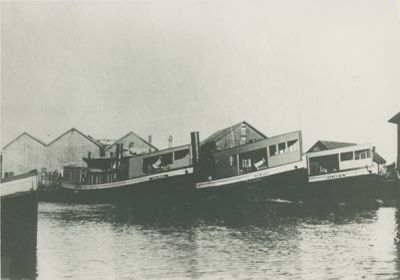 Operated out of Manistique & Escanaba, MI with similar tugs ANABEL (1892) & ALICE (c1901). 1915 Rebuilt Manitowoc, WI; same tonnage. 55 gross / 37 net tons. 1939 Owned William Murphy, Buffalo, NY. Email your Order Comment on this item Create electronic postcard Coffey Fleet, Manistique, MI., c1910.